The Okinawa Governor Takeshi Onaga will visit the United States from May 27 to June 5 to block a new U.S. military base from being built in Henoko, Nago. In Washington D.C., he will meet U.S. officials. The Governor will request that the U.S. government, which has left Okinawa with the excessive burden of hosting the bulk of Japan’s U.S. bases for 70 years after the war and is potentially introducing an additional burden to the island, to give up the current building plan. The Nago Mayor Susumu Inamine will accompany the Governor. This is the first time a Governor of Okinawa and a Mayor of Nago have visited Washington together to appeal directly to US leaders since 1996, when the Government of Japan and the U.S. agreed to close and relocate Futenma Air Station to Nago. On May 17, at a protest rally that drew a massive turnout of about 35,000 people, Governor Onaga, who won the gubernatorial election in November 2014 with overwhelming public support, declared, “As a governor in receipt of the mandate given by the citizens of Okinawa, I will use every possible means to block the base from being built.” Washington and Tokyo are steadily pushing forward with the work in Henoko irrespective of Okinawan public opinion, which is giving rise to a mood of revolt among citizens. The Government of Japan has said the current plan to relocate the base to Henoko is the only realistic option. However, Governor Onaga rebutted this while making a speech at the Foreign Press Club in Tokyo, saying; “I fully understand (the importance) of the Japan-U.S. alliance. If there is an accident in Futenma after Tokyo fails to build the new base in Henoko, the security system between the United States and Japan may in fact prove nothing more than a house of cards. ” He implied that the current plan will come to a deadlock and warned the U.S. and Japan not to continue putting Okinawan lives in danger. The former Governor Hirokazu Nakaima met Assistant Secretary of State Kurt Campbell and Assistant Secretary of Defense Mark Lippert at the State Department in October 2012 and appealed to them to relocate Futenma outside of Okinawa. However, the U.S. side did not change its stance. Since then, opposition to the Henoko base plan has increased. 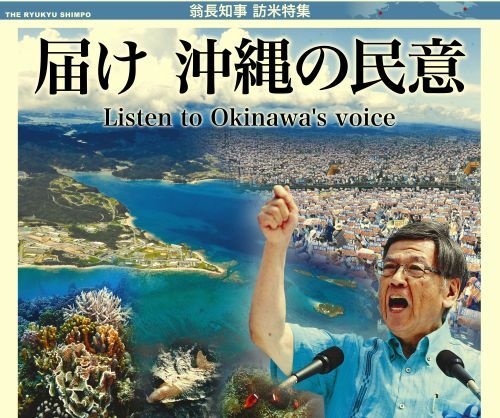 As a key step in stopping the new base’s construction, Governor Onaga plans to bring the Okinawan voice to the center of U.S. government and draw international attention to the unprecedented level of public opposition. Previous Article:The commentaries on Gov. Onaga’s visit to the U.S.